If you haven’t had a chance to go to any of the amazing BC summer music festivals in July, it’s not too late yet to buy tickets and head to one in August or September. Celebrate the second half of the summer by making unforgettable memories with friends, listening to live music and trying out fancy festival outfits. Located on the beautiful Merritt Festival Show Site in Merritt, BC, the Rockin River Music Festival is a four-day family-friendly event featuring country music on three stages and other activities like mechanical bull riding, jumbo pong and human foosball. Music acts include Nitty Gritty Dirt Band, Chris Back Band and Karen Lee Batten. A four-day general pass costs $179; kids 12 & under are free. With over 70 artists performing, the Squamish Valley Music Festival is for everyone, with a wide range of popular musical taste. This year’s biggest acts from across the globe include renowned musicians like Mumford & Sons, Drake and Sam Smith, as well as emerging local talents like Vancouver-based electro-pop artist Willa. A day pass costs $150, a regular weekend pass $325. 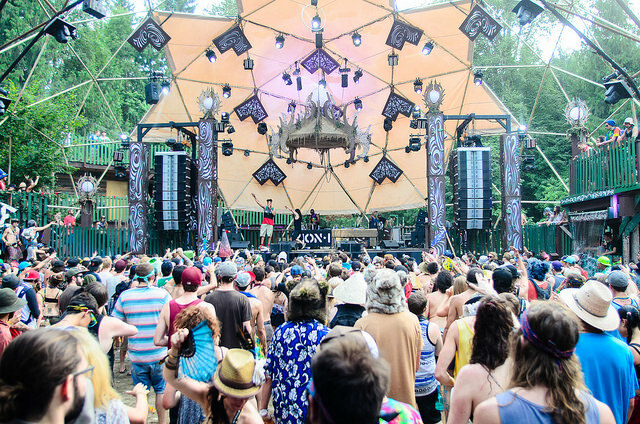 Shambhala is an annual electronic music festival, held at the Salmo River Ranch in a picture-perfect oasis in the middle of the West Kootenay Mountains. The family-run event attracts world renowned DJs and artists from all over the world. Some of the 300 plus acts this year include AC Slater, Pretty Lights, Bonobo, and many more. A weekend ticket costs $365 (incl. tent camping and parking). Ponderosa Arts and Music Festival returns for its third year at the picturesque Rock Creek Fairgrounds in Rock Creek, BC. It’s not the typical music festival but remains independent and affordable; a three-day pass costs $125. Headline artists include Mounties, The Harpoonist & The Axe Murderer, and Bear Mountain, all hailing from Vancouver. Summer festival fans can expect four days of music, food and art at the Rifflandia Festival in Victoria, BC. This event is more laid-back than other festivals and features a great jumble of alt-rock, punk and hip-hop. Music acts this year include Modest House, Chromeo, Julian Casablancas & The Voidz and many more. A four-day pass costs $178.